The Missouri House of Representatives is the lower chamber of the Missouri General Assembly. It has 163 members, representing districts with an average size of 37,000 residents. House members are elected for two-year terms during general elections held in even-numbered years. In 1992 Missouri approved a constitutional amendment providing term limits (previously there were no limits). No Representative may serve more than eight years in the House. Each candidate for the office must be at least twenty-four years old, a registered qualified voter in the state for at least two years, and a resident of his or her district for at least one year. Missouri's house is the fourth largest in the United States although the state ranks 18th in population. Legislation was introduced in 2011 to cut its size to 103 in 2020. Larger legislatures in the United States are New Hampshire (400), Pennsylvania (203) and Georgia (180). These are the yearly recurring committees that hold hearings on legislation filed by Representatives. Once filed, legislation is assigned to one of the following committees by the Missouri Speaker of the House. Legislation is typically assigned to the committee whose province envelopes the subject matter of the bill. However, there are frequently multiple relevant committees to which a bill can be assigned, and it is at the Speaker's discretion to choose which committee receives the bill. Politics can also play a part, as the Speaker may assign a bill he or she wants to fail to a committee with an unfriendly chair or membership, or may select a more friendly committee if he or she wishes the bill to pass. The partisan makeup of each committee is intended to reflect as closely as possible the partisan makeup of the entire House. Each Party caucus selects which of its members will serve on the Standing Committees, and the Chair of each committee is chosen by the Speaker of the House. Tradition in the Missouri General Assembly is that all appropriations bills initiate in the Missouri House rather than the Senate. So each year, the Chair of the House Budget Committee files legislation establishing the spending plan for the state of Missouri. This plan, which in 2007 exceeded $20 billion, may differ greatly from the Governor's budget recommendations, issued at the State of the State address given in late January. The budget legislation is assigned to the House Budget Committee, which then assigns each bill to its respective subcommittee. After the subcommittee makes its recommendations, the full Budget Committee runs through the entire appropriations package, makes its desired changes, and sends the bill to the full House for consideration. Joint Committees contain members from both the Missouri House and Senate. These committees may be permanent and study ongoing issues, or may be temporary and intended to come up with suggested legislation to address a one-time issue. The Chair of these committees typically alternates annually between a Representative and a Senator to prevent unfairness to one chamber. In 1992 Missouri voters approved a constitutional amendment placing term limits on the Missouri House of Representatives. A Representative can serve no more than four two-year terms in the house. The first time term limits prevented someone from running again was in 2002. As of March 2008, members of the Missouri House of Representatives receive an annual salary of $35,915.44. ^ "termlim". House.mo.gov. Retrieved April 5, 2011. ^ CHRIS BLANK/The Associated Press. "Missouri Senate OKs shrinking number of House members". Columbia Missourian. Retrieved April 5, 2011. ^ brenda erickson (October 11, 2007). "Population and Size of Legislature". Ncsl.org. Retrieved April 5, 2011. ^ Republican Caleb Jones (District 50) resigned to join the Eric Greitens administration. ^ Democrat Randy Dunn (District 23) resigned to move to Omaha. ^ Republican Tila Hubrecht (District 151) resigned to return to private life. ^ Republican Sara Walsh elected to succeed Jones. Republican Sandy Crawford (District 129) elected to the Missouri Senate. ^ Republican John McCaherty (District 97) resigned to focus on a run for Jefferson County executive. ^ Republican Paul Fitzwater (District 144) resigned to take a new state job. ^ Republican Joe Don McGaugh (District 39) resigned to become a state judge. ^ "Leadership". Missouri House of Representatives. Retrieved February 18, 2019. 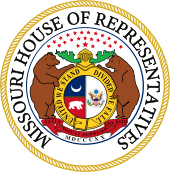 ^ "Missouri House of Representatives". House.mo.gov. Retrieved August 13, 2017. Publications by or about the Missouri House of Representatives at Internet Archive. This page was last edited on 17 April 2019, at 05:31 (UTC).